Off the Beaten Path: What Will He Create in You? What Will He Create in You? I love compliments and well wishes. They encourage me, fuel my dreams and motivate me to excellence. In the same vein, wise counsel and sound instruction open my eyes to new perspectives, help me reevaluate my actions, and set me on the right course. Of course there are also words that wound me. I’ve felt my strength wane with the weight of hurtful words spoken to me with careless abandon. And I’ve felt the wind go out of my sails when someone expressed their doubts in me or joked about my flaws. We’ve all felt the weight of other people’s words, whether that weight pushed us forward or pulled us back. And, of course, we’ve witnessed the surprising impact that our own words have had on others. Sometimes we have spoken powerfully damaging words in haste, with little regard for the lasting blow they would level at the other person, only to wish we could reel them back in. But it’s too late. Even an apology can’t reverse the harm that was done when our targeted words hit their “sweet” spot and punctured someone’s self-esteem, dream, beliefs or joy. Our words and the words of others are indeed powerful. But God’s words are super powerful. When God speaks, He creates (Genesis 1:3), accomplishes His objectives, heals, gives life, raises the dead, redeems, corrects, instructs, rebukes, makes us fit for good works, comforts, satisfies, delights, gives value and executes judgment. The power of His words over ours is magnified exponentially. Our words are powerful, but His are super powerful. Still, His words are also always trustworthy, right, good, and true. We don’t need to fear being wounded by His words, unless He deems a temporary wounding is best in order to bring something good and right to our lives. As we begin this new year, let’s covenant with each other to welcome God’s powerful words into our lives each and every day. Invite Him to speak to you. Listen to, take to heart, meditate on and heed His words. And as He speaks into your life, watch to see what new and wonderful things He creates there. Is there a scripture that God spoke repeatedly to you this past year, using His truth to change you and conform you to His image? 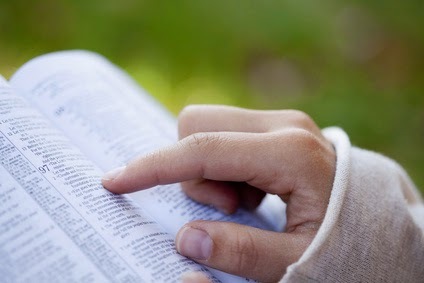 Consider beginning a scripture meditation album for 2014 in which you place the verses that most resonate with you, choosing to meditate on them daily so they can do a supernatural work in your life.